The Alhambra in Granada, Spain, is distinct among Medieval palaces for its sophisticated planning, complex decorative programs, and its many enchanting gardens and fountains. Its intimate spaces are built at a human scale that visitors find elegant and inviting. The Alhambra, an abbreviation of the Arabic: Qal’at al-Hamra, or red fort, was built by the Nasrid Dynasty (1232-1492)—the last Muslims to rule in Spain. Muhammad ibn Yusuf ibn Nasr (known as Muhammad I) founded the Nasrid Dynasty and secured this region in 1237. He began construction of his court complex, the Alhambra, on Sabika hill the following year. 1,730 meters (1 mile) of walls and thirty towers of varying size enclose this city within a city. Access was restricted to four main gates. 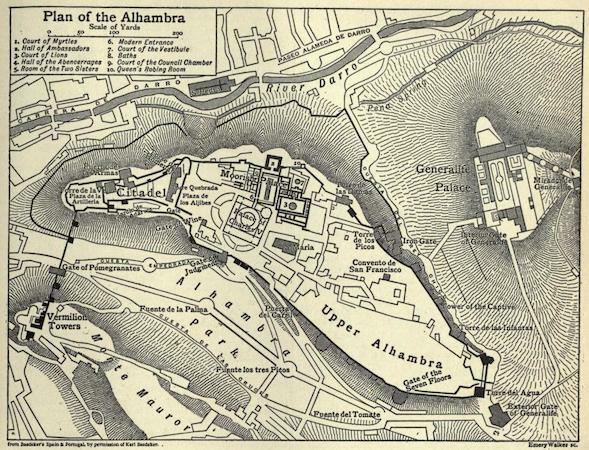 The Alhambra’s nearly 26 acres include structures with three distinct purposes, a residence for the ruler and close family, the citadel, Alcazaba—barracks for the elite guard who were responsible for the safety of the complex, and an area called medina (or city), near the Puerta del Vino (Wine Gate), where court officials lived and worked. The different parts of the complex are connected by paths, gardens and gates but each part of the complex could be blocked in the event of a threat. The exquisitely detailed structures with their highly ornate interior spaces and patios contrast with the plain walls of the fortress exterior. 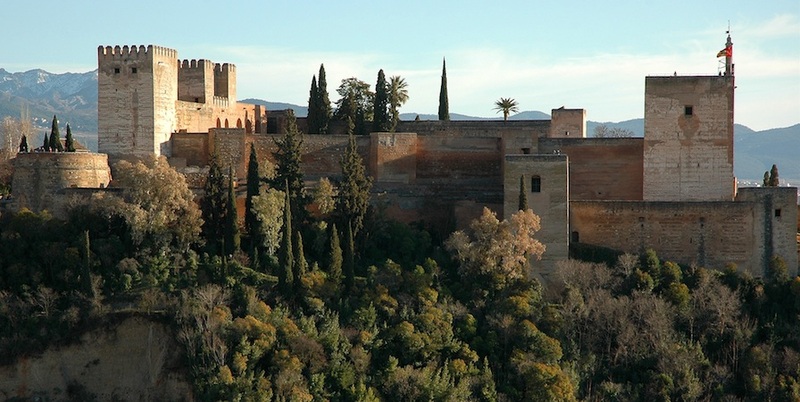 The Alhambra’s most celebrated structures are the three original royal palaces. These are the Comares Palace, the Palace of the Lions, and the Partal Palace, each of which was built during 14th century. A large fourth palace was later begun by the Christian ruler, Carlos V.
El Mexuar is an audience chamber near the Comares tower at the northern edge of the complex. It was built by Ismail I as a throne room, but became a reception and meeting hall when the palaces were expanded in the 1330s. The room has complex geometric tile dadoes (lower wall panels distinct from the area above) and carved stucco panels that give it a formality suitable for receiving dignitaries (above). Behind El Mexuar stands the formal and elaborate Comares façade set back from a courtyard and fountain. The façade is built on a raised three-stepped platform that might have served as a kind of outdoor stage for the ruler. The carved stucco façade was once painted in brilliant colors, though only traces remain. A dark winding passage beyond the Comares façade leads to a covered patio surrounding a large courtyard with a pool, now known as the Court of the Myrtles. This was the focal point of the Comares Palace. 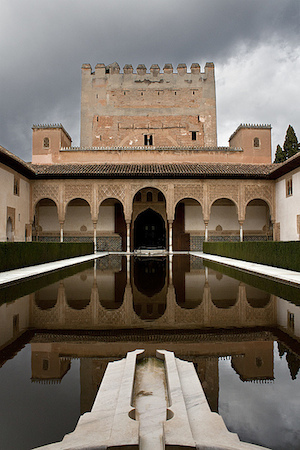 The Alhambra’s largest tower, the Comares Tower, contains the Salón de Comares (Hall of the Ambassadors), a throne room built by Yusuf I (1333-1354). 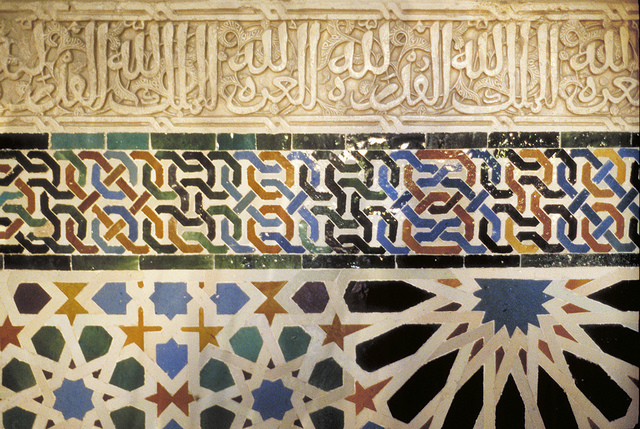 This room exhibits the most diverse decorative and architectural arts contained in the Alhambra. The double arched windows illuminate the room and provide breathtaking views. Additional light is provided by arched grille (lattice) windows set high in the walls. 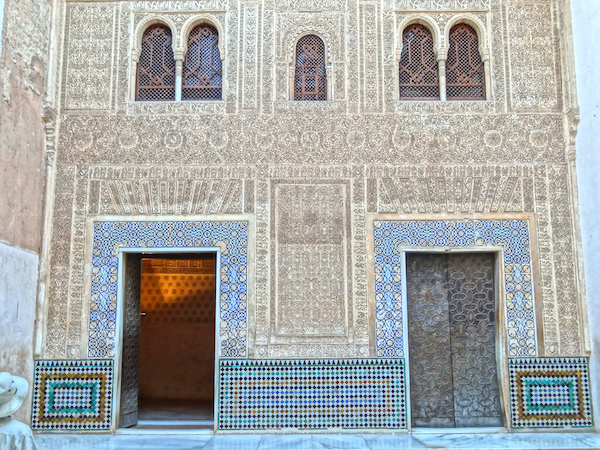 At eye level, the walls are lavishly decorated with tiles laid in intricate geometric patterns. 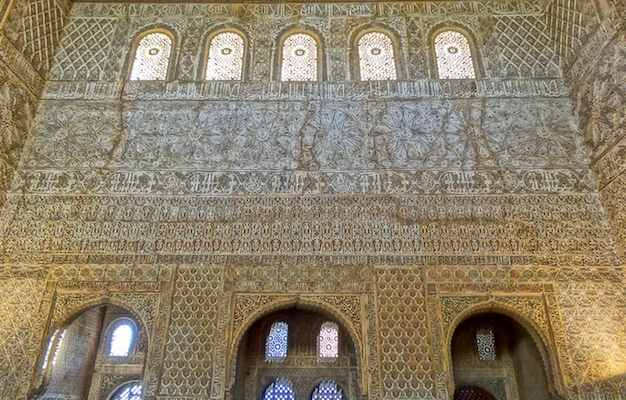 The remaining surfaces are covered with intricately carved stucco motifs organized in bands and panels of curvilinear patterns and calligraphy. The Palacio de los Leones (Palace of the Lions) stands next to the Comares Palace but should be considered an independent building. The two structures were connected after Granada fell to the Christians. Muhammad V built the Palace of the Lions’ most celebrated feature in the 14th century, a fountain with a complex hydraulic system consisting of a marble basin on the backs of twelve carved stone lions situated at the intersection of two water channels that form a cross in the rectilinear courtyard. An arched covered patio encircles the courtyard and displays fine stucco carvings held up by a series of slender columns. Two decorative pavilions protrude into the courtyard on an East–West axis (at the narrow sides of the courtyard), accentuating the royal spaces behind them. To the West, the Sala de los Mocárabes (Muqarnas Chamber), may have functioned as an antechamber and was near the original entrance to the palace. 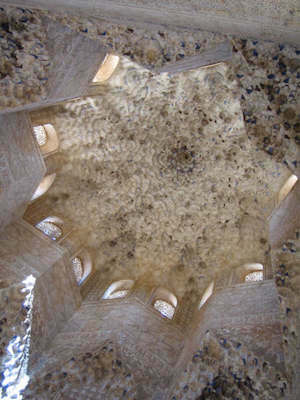 It takes its name from the intricately carved system of brackets called “muqarnas” that hold up the vaulted ceiling. 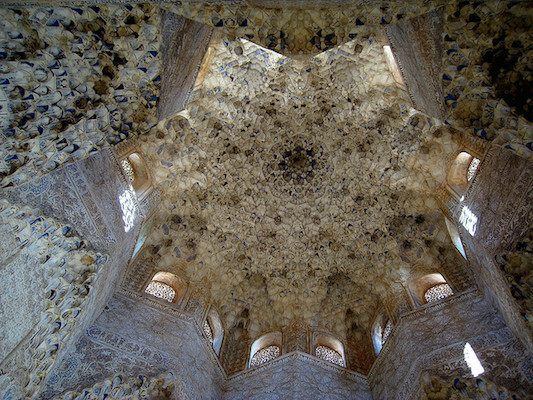 Across the courtyard, to the East, is the Sala de los Reyes (Hall of the Kings), an elongated space divided into sections using a series of arches leading up to a vaulted muqarnas ceiling; the room has multiple alcoves, some with an unobstructed view of the courtyard, but with no known function. This room contains paintings on the ceiling representing courtly life. The images were first painted on tanned sheepskins, in the tradition of miniature painting. They use brilliant colors and fine details and are attached to the ceiling rather than painted on it. There are two other halls in the Palace of the Lions on the northern and southern ends; they are the Sala de las Dos Hermanas (the Hall of the Two Sisters) and the Hall of Abencerrajas (Hall of the Ambassadors). Both were residential apartments with rooms on the second floor. Each also have a large domed room sumptuously decorated with carved and painted stucco in muqarnas forms with elaborate and varying star motifs. The Palacio del Partal (Partal Palace) was built in the early 14th century and is also known as del Pórtico (Portico Palace) because of the portico formed by a five-arched arcade at one end of a large pool. 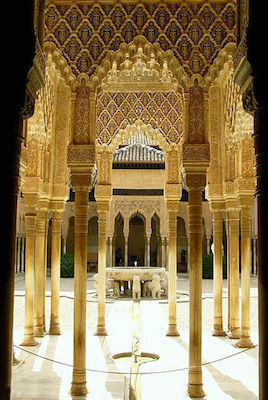 It is one of the oldest palace structures in the Alhambra complex. In one of the most spectacular Generalife gardens, a long narrow patio is ornamented with a water channel and two rows of water fountains. Generalife also contains a palace built in the same decorative manner as those within the Alhambra but its elaborate vegetable and ornamental gardens made this lush complex a welcome retreat for the rulers of Granada. To be sure, gardens and water fountains, canals, and pools are a recurring theme in construction across the Muslim dominion. 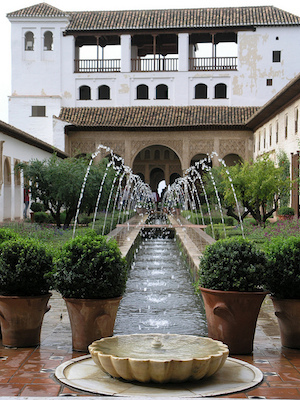 Water is both practical and beautiful in architecture and in this respect the Alhambra and Generalife are no exception. But the Nasrid rulers of Granada made water integral. They brought the sound, sight and cooling qualities of water into close proximity, in gardens, courtyards, marble canals, and even directly indoors. 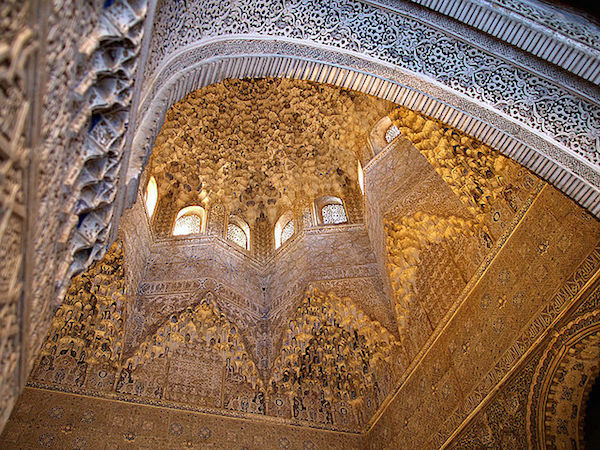 The Alhambra’s architecture shares many characteristics with other examples of Islamic architecture, but is singular in the way it complicates the relationship between interior and exterior. Its buildings feature shaded patios and covered walkways that pass from well-lit interior spaces onto shaded courtyards and sun-filled gardens all enlivened by the reflection of water and intricately carved stucco decoration. More profoundly however, this is a place to reflect. Given the beauty, care and detail found at the Alhambra, it is tempting to imagine that the Nasrids planned to remain here forever; it is ironic then to see throughout the complex in the carved stucco, the words, “…no conqueror, but God” left by those that had once conquered Granada, and would themselves be conquered. It is a testament to the Alhambra that the Catholic monarchs who besieged and ultimately took the city left this complex largely intact. Cite this page as: Shadieh Mirmobiny, "The Alhambra," in Smarthistory, August 8, 2015, accessed April 21, 2019, https://smarthistory.org/the-alhambra/.